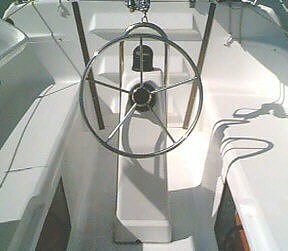 Super Sport Marine Boat Accessories: Large WheelSuper Sport Marine, Inc. The yachtsman who wishes a larger wheel will want this optional accessory. The new Large Wheel measures over 20 inches across and offers the helmsman comfort if you prefer to stand at the wheel when you motor. The large wheel allows you to steer from a more comfortable position when seated in the cockpit. The perfect size to easily scoot around when moving about the cockpit. The large wheel fits the steering assembly without modification and installs easily.